Ces enfants de ma vie, by Gabrielle Roy – This French collection of related tales starts out slowly with some shorter stories, but keep with it! It builds into longer, more personal tales of life as a young teacher in remote areas of 1930’s Canada. We read this for our local book club, and those of us who finished it could not stop talking about the ending. The sweet descriptions of the Canadian landscape are a great touch to help you embrace the colder seasons, too. Hocus Pocus, by Kurt Vonnegut – The story of a war veteran who teaches at a college for the disabled, then at the prison across the lake, and survives the takeover of the town when the inmates escape (among other things). It hits a bit close to home in the current American political climate, but Vonnegut is one of my favorite authors. Perfect if you like witty, sometimes dark humor. Pacsirta, by Dezső Kosztolányi – For those of you who read Hungarian, I loved this description of a family experiencing temporary empty-nesting when a couple’s daughter visits cousins out of town. Plenty of laughs, with enough substantive food for thought to keep you hooked. And there’s no sappy Disney ending. The River of Doubt: Theodore Roosevelt’s Darkest Journey, by Candice Millard – I am still working on this piece of non-fiction. Teddy Roosevelt was a total character with huge capacity for persistence. This book documents the trip he took after losing his bid for a third presidential term, down the Amazon with his son Kermit. They faced disease, death, and even murder. Fascinating! What are you reading lately? Can you recommend any favorite authors? Share in the comments below! As the voice of over 10,000 interpreters and translators in the United States and abroad, the American Translators Association is very concerned about President Trump’s recent Executive Order to suspend issuing visas to nationals from certain countries in the Middle East and northern Africa. This decision will have a negative effect on interpreters and translators who are citizens of those countries and their personal and business relations with the US. It may have a particularly adverse effect on those interpreters who bravely served with US forces in Iraq. ATA has been monitoring the progress of the US government’s Special Immigrant Visa program, which issues visas to interpreters assisting forces in Iraq and Afghanistan. ATA expressed its displeasure in the New York Times in February 2016 (“Visas for Interpreters”) when the government attempted to delay and complicate the application process for this program. The government ultimately rejected its plans thanks to pressure from ATA and others. Nevertheless, ATA will continue to raise objections to any obstruction to this successful and valuable program. ATA values the strengths and skills of its diverse membership, which includes a large number of immigrants to this country as well as overseas members in over 100 countries. The experience and expertise brought by these members not only benefit the association, but the nation at large. I would also encourage all of my colleagues in the US and abroad to practice compassion in their communications and actions in the coming days and months. Individuals on every side of the many issues that have arisen are afraid, but we cannot make good choices and establish positive change from a place of fear. Be kind to your neighbors, colleagues, and strangers in the street. We’re all in this together. I am lucky to have an active French book club here in Sacramento. We recently read Des nouvelles d’Édouard, by Michel Tremblay – and I heartily recommend adding it to your list. We take turns suggesting books for our next meeting, and this one came with the very simple description of being “a novel about a man from Montreal who travels to Paris.” Imagine my surprise when the prologue establishes our hero as an aging drag queen! Édouard inherits a sum of money from his mother and decides to go to France to make his dream come true; he documents the ocean voyage as a journal to his sister-in-law, in lieu of letters. Édouard’s homosexuality certainly crops up as a theme in his notes, but only a minor one, really. His struggles to meet someone are the same for everyone, no matter your preferences. What really stood out to me was the difficulty he had with social class. His ticket to Paris was bought with a small inheritance, and clearly he could never have afforded it otherwise on his salary as a shoe salesman. I was thrilled when he went all out, opting for first class, to better study the habits of the highfalutin people he normally only interacted with by serving. In some ways, he enjoys it; in other ways, he doesn’t. Besides wrestling with how to come across as “Kultured” to the upper-class women on board without being totally bored out of his skull, Édouard has to deal with the aggressive sexism of the men assigned to his first-class dining table. And that’s on top of all your standard culture shock issues. Des nouvelles d’Édouard is full of laugh-out-loud one-liners. It was the most fun book I’ve read all year, truly. I should warn you, this was a divisive selection for our club. Those of us who loved it had a lot of fun with it; others just didn’t connect with the author’s sarcasm or criticism of France. In case this one doesn’t sound quite like your cup of tea, keep in mind that Des nouvelles d’Édouard is 4th in a series of 6 semi-autobiographical novels by Michel Tremblay; each works fine as a stand-alone, and I hear the others are even better, and a bit different. What good books have you picked up lately? What’s the last surprising thing you’ve read? Share in the comments below! Happy St. Stephen’s Day! In celebration of this important Hungarian holiday, I’ve found a local entrepreneur to share a bit of Hungarian culture with you. Enjoy! Hungary holds a rich tradition of textiles, including ornate and diverse embroidery work. There are over 20 styles of Hungarian embroidery. Most include floral motifs in geometric patterns, and the majority of patterns are linear and symmetrical. Kalocsa, Matyó, and Kalotaszeg are some of the most well-known styles. I’d like to share some information about Hungarian Kalotaszeg írásos from Transylvania. Írásos, “written” in Hungarian, received its name from the process of writing or drawing the pattern on the fabric before stitching. Similar to crewel work, the stitching creates a raised line, traditionally done on linen. 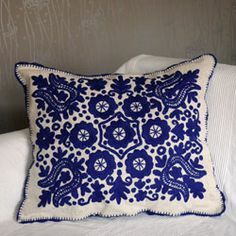 Whereas British crewelwork uses wool thread, Hungarian írásos is made with cotton thread. The stitch itself resembles a double chain stitch. Írásos are stitched in all one color, red, blue, white, or black. Red symbolizes youth and health, blue stands for adulthood, maturity, and wisdom, and black for mourning. Patterns were based on Renaissance and Baroque flowers and flourishes. The symmetry, full compositions that cover the space, and connecting vines and leaves were inspired by Persian Islamic art. Women have sewn tapestries to commemorate births, graduations, and weddings in their families and for gifts to their church community, as well as pillowcases and tablecloths. Linens for the home were originally sewn as part of dowries. The written style was not traditionally made for clothing. The style developed in the 1700s and became well-known internationally in the late 1800s and early 20th century, due to Kalotaszeg woman Gyarmathy Zsigáné, who promoted the embroidery in exhibitions in Brussels, Vienna, and St. Louis. Composer Béla Bartok collected textiles from the region in the early 1900s while recording folk music that influenced his work. Anthropologists and textile enthusiasts have since treasured Kalotaszeg írásos. Fewer and fewer women have been practicing the craft over the last 50 years. Today, apart from museums, one can find Kalotaszeg embroidery in the Hungarian Calvinist churches and the formal rooms in women’s homes. Some pieces are for sale at the market but they are often of lesser quality, stitched quickly to make money. The practice is disappearing due to the long, meticulous labor required and the pull of modern life. Like many organizations around the world promoting ethnic textiles and traditions, ThreadWritten Textiles supports Kalotaszeg írásos and the women who still practice this beautiful craft. ThreadWritten makes modern bags and home décor that combine traditional embroidery with contemporary design using fair trade principles. Sarah Pedlow is the owner and designer at ThreadWritten Textiles, a Bay Area business that aims to support women artisans, their communities and cultures, by paying fair trade wages, preserving the integrity of traditional styles and techniques within contemporary designs, and educating consumers about lesser-known crafts that are disappearing. She currently focuses on the work of artists from Transylvania, meaning parts of Romania with a strong Hungarian cultural heritage. She holds an MFA in Visual Arts from Rutgers University and a BA in Studio Art and French Studies from Scripps College. Her fine art work has been exhibited in the U.S. and Europe. Visit www.threadwrittentextiles.com to learn more about the women and visit the shop. New bag designs are now in production! Today’s summer reading recommendation comes from Corinne McKay, an ATA-certified French to English translator based in Boulder, Colorado and specializing in international development, legal and corporate communications translations and non-fiction books. You might already know her from her blog (now a book), Thoughts on Translation. First, a confession: the major casualty of my career as a translator has been my lifelong love of reading. After reading and writing for work all day, I’m just overloaded with words, and I’d usually rather work in my garden, play a musical instrument or do yoga than look at another printed word. Unless I’m on vacation, the longest thing I generally read without getting paid for it is the New Yorker, and it takes me several evenings to get through those. Oh, and one more thing: I hate fiction. There are so many interesting true stories out there…who needs the fake ones? Within the world of fiction, I have a particularly low tolerance for epic historical novels. Anything with a directory of characters and a timeline of events is something I don’t have the attention span for; just give me back my New Yorker already. So, when I tell you that I am obsessed-nothing short of obsessed—with Hilary Mantel’s epic historical novels Wolf Hall and Bring Up the Bodies, and I’m considering camping out at her house until she finishes the next in the trilogy, The Mirror and the Light, I mean that you need to read them right this red-hot second if you haven’t read them already. General plot line: England under Henry VIII, from Henry’s breakup with Katherine of Aragon through his marriage to Anne of Cleves, told from the point of view of Henry’s lawyer, Master Secretary and confidant, Thomas Cromwell. You’ve heard the story before, but never (never!) 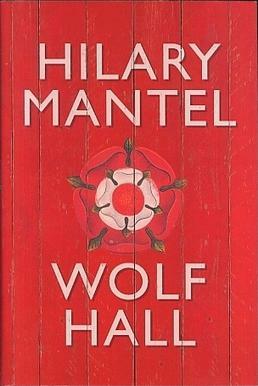 like this, because Hilary Mantel’s writing will leave you gasping for breath, even though you know how the thing ends. Here’s an example: while listening to the audio book of Bring Up the Bodies with my family during a road trip to Utah, we got to the section where Henry is knocked unconscious in a jousting contest, and for about 20 minutes everyone thinks he’s dead. I was driving, and I literally shouted at the narrator, “He’s not dead! Check for a heartbeat! He hasn’t even beheaded Anne Boleyn and married Jane Seymour!” See what I mean? She had me; I checked the audio version of Bring Up the Bodies out of the library, and my family listened through the entire 12 hour roundtrip drive to Utah and back. Then my husband and I had to take shifts finishing the print version (“You had it last night…give it to me and go wash the dishes”) and considered buying two copies of Wolf Hall to avert marital discord. We read/listened to the books in reverse order, which has its pluses and minuses. Plus: you don’t get that attached to your favorite characters—as a lute player, I developed a particular soft spot for the sweet and naïve lutenist Mark Smeaton—because most of them get executed or die of “the sweating sickness” in book two. Hilary Mantel has really converted me; I’ve come to realize that it takes a special skill to write a breathtakingly gripping book about a story that everyone already knows. I now feel like I understand this historical period, and thus the underpinnings of modern Europe, much more fully. It’s also been fascinating to learn the “stories behind the story,” and my husband and daughter and I have spent hours poring over Wikipedia entries about the characters in Mantel’s books. Did the Archbishop of Canterbury really have a secret wife? (Totally) Did people really call the newborn Princess Elizabeth “the ginger pig,” due to her red hair and homely appearance? (Likely) Was Henry VIII possibly the father of Anne Boleyn’s sister’s son Henry? (Yes…yikes!) And what was “the sweating sickness” anyway? (Probably a form of hanta virus) So thank you, Ms. Mantel, and if you see someone lurking outside your office window with binoculars, peering at the text of The Mirror and the Light (due out in 2015…but exactly when in 2015???) on your computer, it’s me! Psst! Head on over to this blog’s Facebook page for my annual summer giveaway. I just couldn’t wait until my August anniversary to share this one. 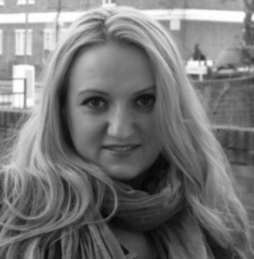 Today’s summer reading recommendation comes from Alina Cincan, a former teacher, translator and interpreter with over 9 years’ experience, total language geek, avid reader, Managing Director at Inbox Translation. When not writing on her own blog, she is writing on other people’s. Alina has a soft spot for sushi, books, shoes and make-up. You can get in touch on Twitter, Facebook, Google+ and LinkedIn. Asking me to write about books and reading usually leads to lots and lots of pages of relentless ranting (the relevant type, of course), but I’ll behave and try to keep it short and sweet. As an avid reader who devours close to 150 books a year, you can imagine it’s not easy to pick one. But after giving it a thought, I decided to talk about the latest novel from one of my favourite authors. 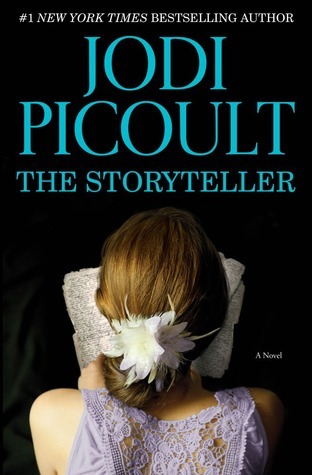 I’ve read all of Jodi Picoult’s books and loved them. The Storyteller was no different, and by that I mean it really had an impact on me. You know that feeling you have after you’ve read a good book? The lingering sensation that doesn’t let you pick up a new novel because you are still entrapped in the one you’ve just put down? The Storyteller is one of those books. A dark Gothic fairy tale, a young baker with a scarred face and soul who has an affair with a married funeral director, the story of a Holocaust survivor – you may wonder how all these can be woven into the same novel. Beautifully, that’s how. This is a book about intertwined destinies. It is a book about monsters, more about real ones hiding behind a human mask than the fantasy ones. Sage Singer is a young baker who has chosen to work by night mainly because of a scar that covers half her face. She befriends a 95-year-old man, a former teacher of German, a pillar of the community who turns out to have plenty of skeletons in his closet. He is a former Nazi SS Guard at Auschwitz who is now looking for forgiveness and help to die from a Jew. While an atheist, Sage’s family is Jewish. Moreover, her paternal grandmother, Minka, is a Holocaust survivor, who has always been quiet about her life in the Auschwitz concentration camp and whose heart-wrenching story is central to the novel – this part will tug at your heart strings, will make you weep and feel grateful not to have lived all those horrors. Like Scheherazade, her story (the fantasy she writes about) keeps her alive, in more ways than one. Though there isn’t a film yet based on ‘The Storyteller’ (I like to watch films inspired by books to compare), I can easily imagine one being made. Even while flipping the pages over (actually tapping my Kindle, but you get the idea), my imagination ran wild and it was like I was actually watching a film. I could see Sage’s scar, the upiór in Minka’s story, the horrors of the Holocaust. But what this book does best is making you use all your senses – I could smell the freshly made bread baked by Minka’s father, I could taste the sweetness of the cinnamon and chocolate in the special roll he baked for his favourite daughter, I could feel the roughness of the makeshift bed in the concentration camp, I could hear the screams of the mothers whose children had been cruelly removed from their arms. Would I recommend it? YES!!! The ones who were shot in the head left behind a mess, runnels of gray matter and foamy pink tissue, and now it was on my boot, caught in the treads, and I wondered what part of her mind that was – the power of language? Of movement? The memory of her first kiss or her favourite pet or the day she moved to the ghetto? You can read an excerpt, listen to the author talking about the book in an interview on CNN and, quite a nice addition I’d say, find Minka’s recipes on Jodi Picoult’s website at http://www.jodipicoult.com/the-storyteller.html. Have you read ‘The Storyteller’? Alina and I would love to hear what you think. Or maybe another of Jodi’s books? Alina also loved ‘The Pact’ and ‘My Sister’s Keeper’. Enjoy! I want to share Gretchen Rubin’s list of a reader’s inalienable rights. I’m sure I’ve shared them here before, but they’re worth sharing again. Many of you have heard the advice “read often, daily” as a way to improve your professional skills. This is good advice… until it starts to become a burden. As a translator (or interpreter), words are your job. Your rent-payer. The bulk of your waking hours. But reading should never feel that way—even slogging through the most dull, monotonous, poorly written text, you should enjoy playing with the words. Laughing at the ineptitude, or piecing together an improvement, or enjoying the one little phrase the original author actually did well amongst the pile of… not so good ones. You have the right to read “below your level.” Just because you like Dostoevsky doesn’t exclude you from reading Mary Higgins Clark. You have the right to read comic books, wine labels, and stories from your source-language country’s version of People magazine and call it research (or not!). You have the right to give your eyes a rest and go to the beach/golf course/local bar instead. In short, keep it fun! What other professional reader rights can you add to this list? What do you read for fun? Just in case you didn’t find anything that piqued your interest in the comments from Tuesday’s open thread, here are some suggestions I’ve been collecting for the last month or so from colleagues around the world. Have you read any of these yet? What are your favorite books for summer? Room, by Emma Donoghue—a book that leaves a long-lasting impression. Not for the faint of heart. The Dog Stars, by Peter Heller—brilliant. just fantastic read, especially if you like camping. What books do you recommend for relaxing with over the summer? Add your own titles in the comments!